Americans’ Confidence About Their Own Finances Reaches Near-Record Highs - 24/7 Wall St.
Americans are feeling more and more confident about their finances in 2019. It turns out that the stock market panic late in 2018, all the trade war fears and even a partial government shutdown did not discourage America’s optimism all that much. A new poll from Gallup showed that 69% of Americans expect their financial situation to improve over the next year, and 50% of Americans now say that they are in better shape financially than a year ago. It is one thing to have high numbers, but it means little without context. This level of optimism about finances is almost at a record high, one not seen since the 71% optimism reported back in 1998. 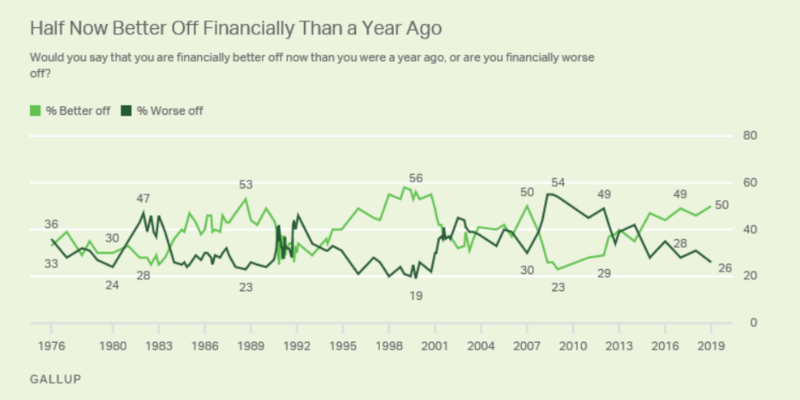 While the report is a strong one, Gallup did note that Americans are typically less positive about how their finances have changed over the past year than they are about where they’re headed. Still, the 50% who said that they are better off today than they were a year ago is a post-recession high. For more context: it was the first time since 2007 that at least half of the public believes that they are financially better off than they were a year ago. As has been shown in other surveys, there is also a degree of partisanship playing a role in past and future perceptions. Gallup signaled that members of most major demographic groups are more likely in 2019 to say their financial situation has improved in the past year than to say they are worse off. Democrats were the one major exception. The latest read showed that 37% of Democrats said that they are worse off financially rather than better off. That figure was just 32% a year ago. 62% of those under 30 say they are better off; 25% say worse off. 45% of women say they are better off; 29% say worse off. 45% of those with annual household incomes of less than $40,000 say better off, 35% worse off. 40% of liberals say they better off, 31% worse off. Among groups that are more Republican than the national average, 66% of conservatives say they are better off, as do 57% of those with annual incomes of at least $100,000 and 56% of men. For both Republicans and Democrats, results are more positive over the same time spans for the question asking about financial expectations for the coming year. Though Republicans’ expectations rose after Trump took office and Democrats became less optimistic, majorities from both parties said they expected to be better off in the coming year in both the pre-Trump-election polls and the post-Trump-inauguration ones. As far as how these polls are measured, Gallup conducted telephone interviews from January 2 through January 10 from a random sample of 1,017 adults aged 18 and older from all 50 states (and the District of Columbia). Each sample of national adults includes a minimum quota of 70% cellphone respondents and 30% landline respondents. Gallup projects that its margin of sampling error is four percentage points (+/-) at the 95% confidence level.